Bonito flakes on a table, cats on a screen, and a Neko Atsume themed staff board on the wall of Bearsley Media Center. Allison Hrabar ’16 gave a presentation on Neko Atsume to several ITS staff members as well as some Swatties on Friday to explain the craze for a simple virtual cat collecting game. The player uses fish currency to buy cat food, toys, or furniture to lure cats into the virtual lawn. The cats then leave fish behind, which the player can use to buy more food to lure more cats. (No one knows where the cats get the fishy currency.) If there is a goal to the game, it’s to collect all 49 cats — 32 regular cats and 17 rare cats. Regular cats, such as Snowball, Shadow, and Marshmallow are not that demanding, and they’ll play with or eat most things in the virtual lawn. Rare cats like Joe Diomeowgio, Saint Purrtrick, Lady Meow Meow, or Chairman Meow have specific wants, but it’s usually obvious what they like. One wouldn’t leave a baseball to lure Chairman Meow in the lawn, for instance, because Chairman Meow likes to play with Earthenware pots. The cats leave not only fish, but also little mementos for players to collect. Sometimes, it’s the shell of a cicada, a dead mouse, a signed baseball, or a silent bell. Players can try to collect all the mementos and take photos of all the cats when they’re in the lawn. Players can also expand the lawn, which adds more spaces for the cats to enjoy. As in all important debates, there were skeptics in the room who weren’t really sure why Neko Atsume has become so popular. Hrabar shared some theories that people have come up with. “Purr Ideology: The Neoliberal Pleasures of Neko Atsume,” by Matt Cornell, posits that Neko Atsume works because it’s the perfect transactional game. The cats are very independent and they don’t ask anything of the players. Players don’t need to clean up after them or care for them. However, if players put out food, they’ll will get more money to buy more food. It’s a free market system where players who do best get rewarded. 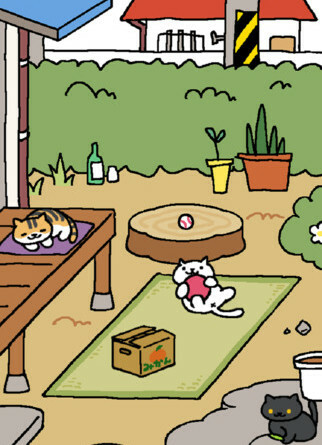 So yeah, that’s Neko Atsume—a game of collecting cats in a virtual lawn. And the best part? There are no strings attached. Featured image courtesy of iTunes. The quote about buying fish is misattributed to me. I was present for the presentation, but I have never downloaded the game. (I don’t even an urge.) I do recall somebody making the remark about buying fish, though.